Greetings from San Antonio Texas! Hello everyone! This here is Mr. Harry Houdini (Houdini) and we just adopted him in Nov. 2015! We are first time dog owners so it's been an experience. He's such a sweet boy and loves to go on long walks, sniff around and pee on everything outside, even when he has no more pee. Thank God he is house trained! A little background about him, he was actually a stray found wandering around a local University. Campus security posted signs all over the neighborhood and no one claimed him. This is how we came to the fortune of adopting him. 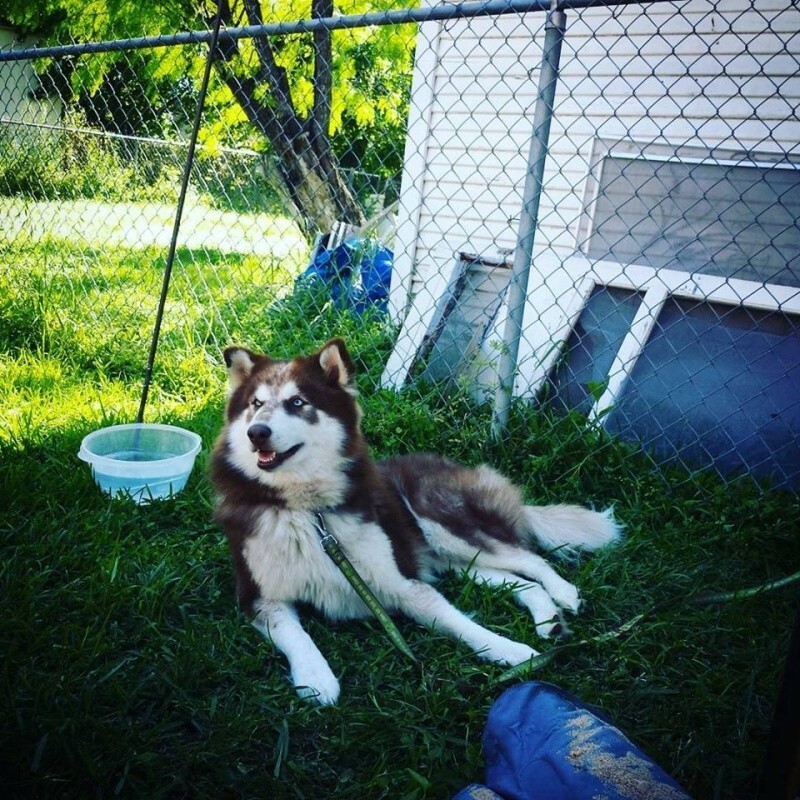 I think he is about a year old, that's what the vet said judging by his teeth but we were wondering, just out of curiosity, if he's even full blooded Siberian Husky? I mean he looks the part but compared to other photos online or on this forum, he seems a bit different. His tail is like a Swiffer duster and his ears a little further apart than most. We were recently approached by another owner about breeding and we let them know this info upfront since we don't want to be misleading, and that's the only reason I'm asking really. He likes to lay on the couch and play with my 4 year old son and myself by jumping around and barking. 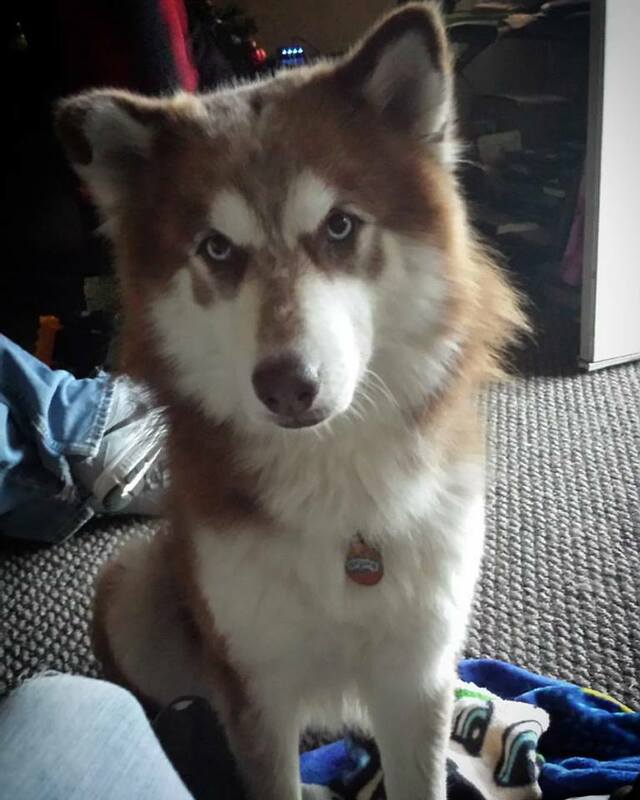 I'm happy to be a part of this form both as a new pet owner and husky owner! I can't see his legs - or rather behind them but from his face and your description of his tail, he may be a wooly siberian husky. Which is what I have - here's a pic. See how fluffy the tail is, the "feathers" on the backsides of his legs...and look at my avatar, you can see the long fur around the face. I agree with Jimmy, the ear placement is quite wide, which is typical for mals. Mainly husky, but I would say some mal there too. Pretty pup and welcome to the forum.....and not to be a Debbie downer, but huskies and mals are in rescues all the time, because people do not understand the work involved, especially puppies, please rethink on breeding, plenty of professional quality breeders out there, jmho. If he isn't fixed, I would get him fixed. It will help with the peeing everywhere and also give you a solid out when some person requests you breed him when they haven't done their homework on what it takes to be a responsible breeder. I absolutely hate when people ask me if I'm interested in breeding my girl because she's pretty. I just want to yell at them that it takes more than pretty looks to put out healthy pups. He is beautiful, but I too think a hint of Mal. Enjoy him being a part of the family. They are always a fun addition. Welcome to the forum! Wow! Houdini has "feathers" on the back of his legs too! I'm glad I have a bit more insight on the type of Husky he is now! Thank you! Yeah I feel weird about the whole "breeding" concept. I mean I feel like a dog pimp ya know? That's just me but my husband and I though we may consider it this once so he can have a friend with us keeping a puppy. Subject: Re: Greetings from San Antonio Texas!